Sometimes there is a demand, (Mommy, I want sourdough bread! ), for sourdough, and not the time to make it properly. Sometimes the state of the economy makes you loathe to throw your starter discard down the sink!! Flour ain't exactly as cheap as it used to be... 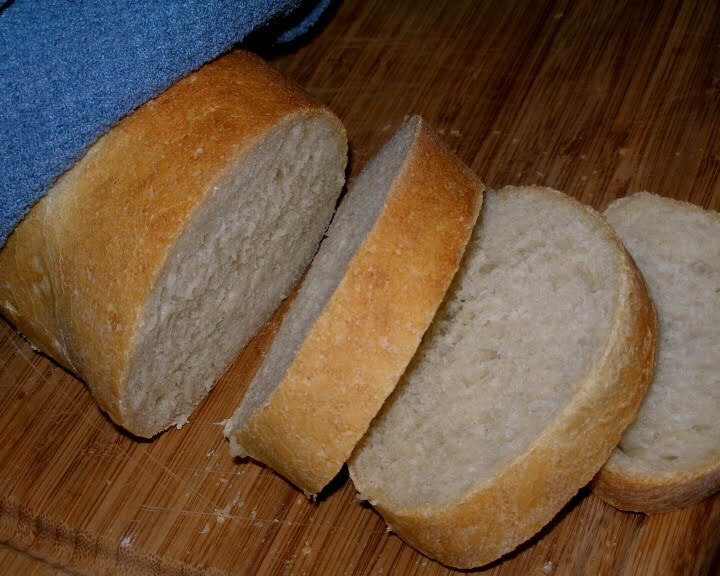 So with all the chowder I have been making lately, I needed some nice soup sopping bread. It's nearly impossible for me to find a storebought bread that will not affect my daughter's allergies and homemade is just so good and fresh anyway. Sourdough is hands down her favorite bread and perfect for accompanying soup. Normally I use my starter a couple times per week and make sure it is good and happy before I put it back in the fridge. This last time though, it had been well over a week since the last use and the starter was looking pretty sluggish. It didn't have a large layer of hooch over it yet, but it was just starting to collect around the bubble mounds. That and the starter was all soupy, like it gets when you neglect to feed it for a week... or more... Still, we had need of bread, just time to do a fairly standard loaf, and a "request" for sourdough. So I figured I would try my neglected, unfed starter with the added yeast method. This post will go to Yeastspotting. I too have unfed starter in the fridge and this is such a great idea! Thanks for commenting about the Charcoal Braid at my blog. Hope you manage to find some charcoal powder in Seattle. Thanks for the how-to. I had some unfed sourdough that I was not in the mood to use in any of the recipes I had, so an online search brought me to your blog. I have my dough made now and resting in the fridge till morning when I'll shape then bake it. Thanks for this! I've been using sourdough starter for various things (crackers, pancakes, impossible pies, soaking oats...) for over a year now, but, believe it or not, have not tried bread yet! i have some starter that needs using and i think I'll give this a try today, it looks easy and rather fool-proof. I found your blog as I was looking for a sourdough recipe. This is a real keeper. 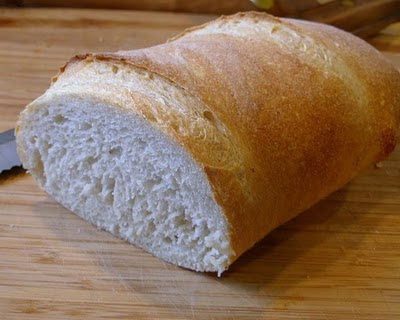 So easy and makes a nice baguette. Thanks!! This bread recipe is fab. Great solution to using under starter up. Thank you. It probably isn't as critical for a recipe like this, but do you have approximate weights for the ingredients? I'm trying to use cups and teaspoons as little as possible these days. This bread was my first attempt at using my discards for a loaf of sourdough while waiting impatiently for my starter to become fully ripe. It turned out great! Easy to make and was very delicious! Slight tang and nice crumb.Was gobbled up! thanks for such a great recipe! Thanks for the recipe but i didn’t use my discard. Instead i use my fed starter right out of the fridge. Since I live in the tropics with temperature between 85F to 100F, it’s never a good idea to leave starter laying around at room temp during the day. So i simply weigh it into my dough. Do you think it would work with whole wheat or spelt? Oh my yes, starter at that temp would have to be fed three times a day or more! I always keep mine in the fridge too unless I want to perk it up a bit. I do think it would work with both whole wheat and spelt, though you might want a little more water with the whole wheat and a little less with the spelt. Spelt tends to want 25% less hydration and likes to spread out as much as rise up. So a 50/50 blend for spelt is excellent unless you are using a banneton to help shape the rise. Kamut also helps the functional properties of spelt, but can be harder to find, especially if you are in an area with smaller grocers. I majored in Food Science because I knew it was a field that would always be changing and innovative. After running a QA lab for a dairy processing facility for a few years, I became a SAHM. Having kids with food allergies taught me more about food in two years than in all my college degree time. I am still learning and changing ideas. Disclosure: I occasionally use affiliate links from amazon. When the weather won't mind, make chowder. Ammonia Cookies - that's Baker's Ammonia!